It can be daunting to pick colors for a new quilt- there are so many to choose from! And when you have to pick 8 colors, plus more for the back and binding. Whew! Never fear! We have a few pointers that may help you narrow down your choices. The Riptide Quilt from Modern Triangle Quilts calls for 1 background fabric, 7 colors, as well as fabric for the backing and binding. These tips will be specifically about those 8 main colors for the top. 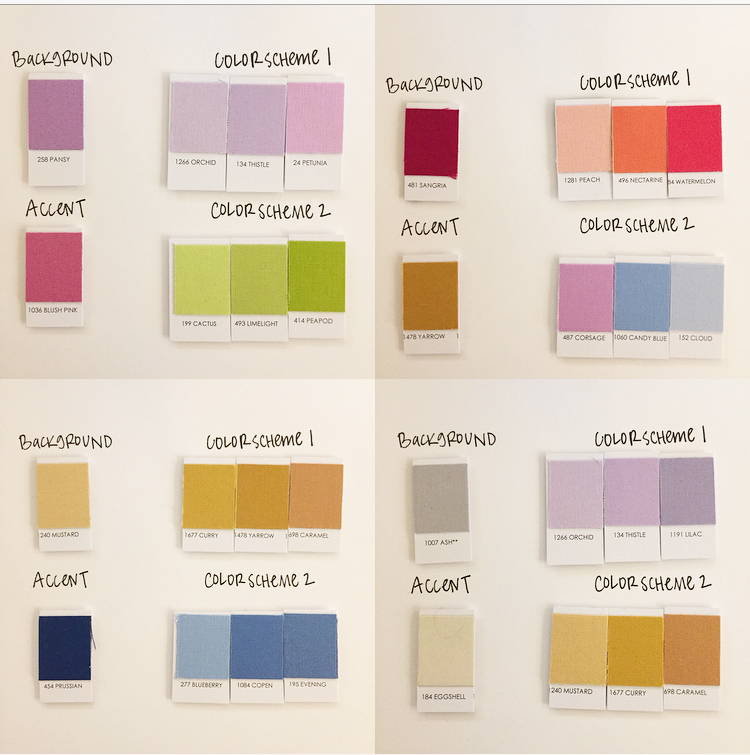 Rebecca’s sample in the book is made up of 4 color categories: Color Scheme 1, Color Scheme 2, the Background color, and an Accent color. No matter what you are thinking for fabric, it may help to see this as a template for making your choices. You’ll notice that she essentially has 3 color families: the main blues, the peaches, and the accent dark blue. To get a similar result to the quilt in the book, pick two color schemes that contrast each other in a pleasing way (peach and blue). Within each color scheme, choose three colors that are low contrast with each other (meaning they are somewhat similar - these are the Color Scheme 1 and Color Scheme 2 colors). For the background choose one color that complements either your Color Scheme 1 or Color Scheme 2-- this could either be lighter or darker than your colors. In the sample, you’ll notice that the background color is a darker color than the Color Scheme 1 colors. Finally choose an accent color that complements, but stands apart from Color Scheme 1 and Color Scheme 2. Second, our advice for prints that have a lot going on is to consider going with more high contrast colors instead of a low contrast ones. You’ll see in our test block below that it’s hard to distinguish the two patterns in the striped triangle and so the pretty details get lost in the tinyness of the pattern- this is both because patterns are big and that some of the colors are too similar. Check out that bottom middle block- you can barely tell there are two patterns there! If these were contrasting colorways, even with a bigger print, it would at least be obvious. But maybe you want some small prints and some solids? We love it! Check out this amazing bundle that Jessica Feldt (@j97feldt) built in the shop! We love how these colors work together - she’s got the greenish yellow + blueish purple as the main color schemes, with a bright pink background and a bold print for the accent. Still having a hard time choosing? 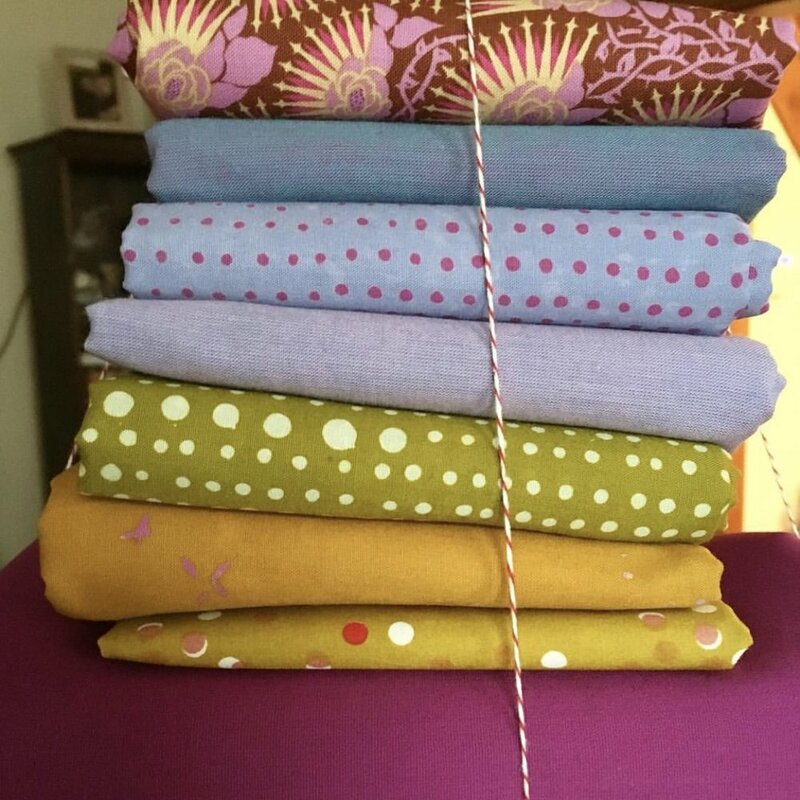 We’re also loving Sarah Jay’s (@criminalgrace) choice to start with a backing fabric and then pull out the colors to make up the quilt top. That’s a great way to narrow your options. Check this out! We made a similar bundle in the shop using the jungle print from Rifle Paper Co.’s Menagerie collection as inspiration. We made the two color schemes (greens and pinks) by pulling colors out of the fabric and might throw a bit of the backing jungle fabric into the front as well. Still have questions?? We can help! We're hosting a LIVE Instagram video THIS FRIDAY, February 23, 2018 at 3:00pm EST. Join in to hear it explained in person, to ask us any questions that you might have, or to just see exactly who is behind this screen. Doesn't work for you? No problem! Feel free to email Mariglynn or the shop with questions any time. You can reach Mariglynn at mariglynn@gmail.com or on IG @mariglynn and the shop is create@domesticitystudio.com. And don’t forget to tag your progress pictures with #riptideqal so we can all follow along! Want to join the Quilt Along?